Polaris plate heat exchangers are lightweight and use limited floor space, so they’re easy, safe, fast, and economical to ship, handle, and install. Countercurrent flow takes heat exchange media in opposite directions across the plate for the most efficient heat transfer. Media circuits are individually gasketed. The area between is vented to the atmosphere. Result: no interleakage with Polaris plate heat exchangers. Inherent design advantages provide shorter response times and more accurate process control. Uniform flow and high fluid turbulence with the Polaris plate design promote constant scrubbing action to reduce fouling. Polaris plate heat exchangers provide low fouling and good drainage. Connections are made to the front; piping stays in place when units are opened. 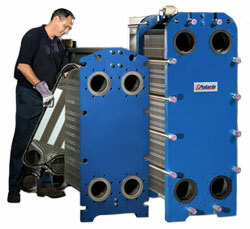 Multiple heating/cooling media can be run with divider sections installed in the heat exchanger. To enlarge a Polaris heat exchanger, just loosen compression bolts and add the plates you need. Polaris plate heat exchangers economize on cooling water and work well even with poor water quality. Polaris PHEs cut valve, piping and pumping costs. Plate heat exchangers from Polaris use less surface area to accomplish the same heat transfer as shell-and-tube exchangers.